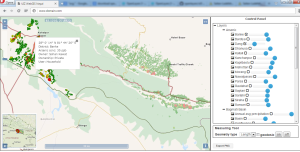 WebGIS Services to Manage Organization for Geographic Knowledge. UIZ brings GIS capabilities into the hands of people using Web and GIS technologies. WebGIS has the ability to enable collaboration, facilitating communication and optimizing the use of information throughout associated organizations. We aim to create a more accessible and flexible participatory environment using GIS tools. It enables access to multiple maps (base maps, demographic, and terrain maps, thematic map etc.) and GIS services including geocoding, routing, geoenrichment, etc. WebGIS enables organizations to properly manage all of their knowledge of their geographic location. WebGIS CMS design and customization. Esri – ArcGIS Web App Templates Customization. Setup, hosting, maintenance of a GIS-Server, Dynamic Map-Server maintenance (for Location ased Services, Fleet management, Weather maps) and Static Map-Server optimization. Integration of various kinds of spatial data such as vectors, maps, air photographs, POIs, photos, videos etc. with meta-data accessory data and links. Creation, revision and management of a database. Open Geospatial Consortium (OGC)/Web Map Service Interface Standard (WMS) conformity for your projects. Interface setup for GIS-Software such as ArcGIS. AJAX, Flash-player or JAVA – Front End for user-friendly clients with high functionality (for example – Routing, Editing- and Analysis-Tools or database queries). High-Performance and cost-effective Back-End-Solutions such as UMN Mapserver or PostgreSQL/PostGIS. Layer-Architecture for combination with other Web-Mapping-Services such as Google, Yahoo, Microsoft Maps or other WMS-Servers. Conversion of vector data (points, lines, polygons, etc.) and raster-data such as topography maps or satellite images. Generation of 3D-models and possible integration with WebGIS services. Generation of KMZ-files for your clients. Setup and hosting of GIS-server with interface for Google Earth/WorldWind for access via Internet/Intranet. Solutions for access control and copy protection to grant security for your data.